Do you have a Highfive user account? Make sure you have the Highfive meeting link. This is usually part of an calendar event invitation or email the meeting organizer will send out. If you don't have it, you can reach out to the organizer to request a link or ask a participant that's already in the meeting to invite you. Note: If you are using Google Chrome version 60+, a new browser tab will open and take you to your meeting. For users of other supported web browsers, you will be prompted to download and install the Highfive application before joining your meeting. You only need to do this once and future clicks on Highfive meeting links will open the application automatically. Click Continue. This will put you right into your meeting. Working from a loud coffee shop or having a bad hair day? You can choose to join the Highfive video meeting with your microphone muted and/or your camera disabled beforehand. If you have multiple audio or video devices connected to your computer, you can also select which one to use by clicking the Settings button. Highfive! You have successfully joined the meeting. 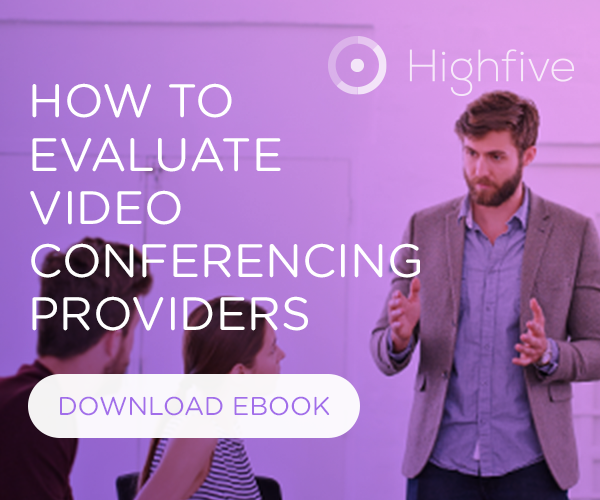 Have you been invited to join a Highfive video meeting, but are not currently a Highfive customer? You can join the meeting as a Guest user! Want to join using your mobile device? Click the Highfive meeting link: This is provided to you by the meeting's organizer. Chrome permissions: Click Allow to give Highfive permissions to use your microphone and camera. You will not be able to use Highfive if you select Block. Check device settings: On the following screen, you will be able to preview yourself, disable your camera and microphone upon joining your meeting, and check/edit your device settings. To keep things simple, Highfive will use the default camera and audio devices on your computer. Enter your name: This will be displayed in the meeting and will help other participants identify you. Click Continue: You will be placed in a waiting room and a notification will be sent to all participants in the meeting. Once they allow you to join, you will be taken into the meeting immediately. These web browsers will require you to download and install the Highfive application in order to join a video meeting. It only takes a minute and we will automatically walk you through this process right before your first meeting, but you can always get Highfive on your computer ahead of time by following these installation steps. Important: As a Guest user, you will not be able to sign into a Highfive account to start your own video meetings. However, you can click on any Highfive meeting link that you have received to join the meeting as a guest. Click on the Highfive meeting link: This is provided to you by the meeting's organizer. Download and install Highfive: You only have to do this once! Skip to Step 3 if you already have the Highfive application. A Highfive application installer file will automatically be downloaded to your computer and opening it will install Highfive. Detailed steps for the installation process can be found here. Once the installation completes, the Highfive application will automatically open and take you to the Joining meeting page. Check device settings: On the following screen, you will be able to preview yourself and check/edit your device settings. To keep things simple, Highfive will use the default camera and audio devices on your computer. Android users will need to install the Highfive mobile app in order to join a video meeting. It only takes a minute and we will automatically walk you through this process right before your first meeting, but you can always get the app from the Google Play Store ahead of time here. Tap on the Highfive meeting link: This is provided to you by the meeting's organizer. Install Highfive: You only have to do this once! Skip to Step 4 if you already have the Highfive application. Tap on the Google Play logo to navigate to the Play Store. Joining the meeting: To direct the Highfive app to join your meeting, leave the Play Store and tap the Highfive meeting link again (from Step 1). Open the app: Chrome will launch. Select open the app to launch Highfive and go to your meeting. Waiting room: You will be placed in a waiting room and a notification will be sent to all participants in the meeting. Once they allow you to join, you will be taken into the meeting immediately. iOS users will need to install the Highfive mobile app in order to join a video meeting. It only takes a minute and we will automatically walk you through this process right before your first meeting, but you can always get the app from the App Store ahead of time here. Important: As a Guest user, you will not be able to sign into a Highfive account to start your own video meetings. However, you can click on any Highfive meeting link that you have received to join the meetings as a Guest. Tap on the App Store logo. Joining the meeting: To direct the Highfive app to join your meeting, leave the App Store and tap the Highfive meeting link again (from Step 1). Open the app: Safari will launch. Select Open to launch Highfive and go to your meetings. Select your experience: Choose how you want to join your Highfive meeting (video, no video, or dial-in by phone). If you are experiencing issues joining a meeting, please contact Highfive Support at help@highfive.com.